It's not always that one gets injured while doing domestic work at home. But, it did happen to me, just two days ago. I was trying or I was cooking when I got injured. Never try to do so many things at the same time. Multi-tasking while cooking just isn't a clever thing to do. That's what I constantly do; not just at home but also at work. 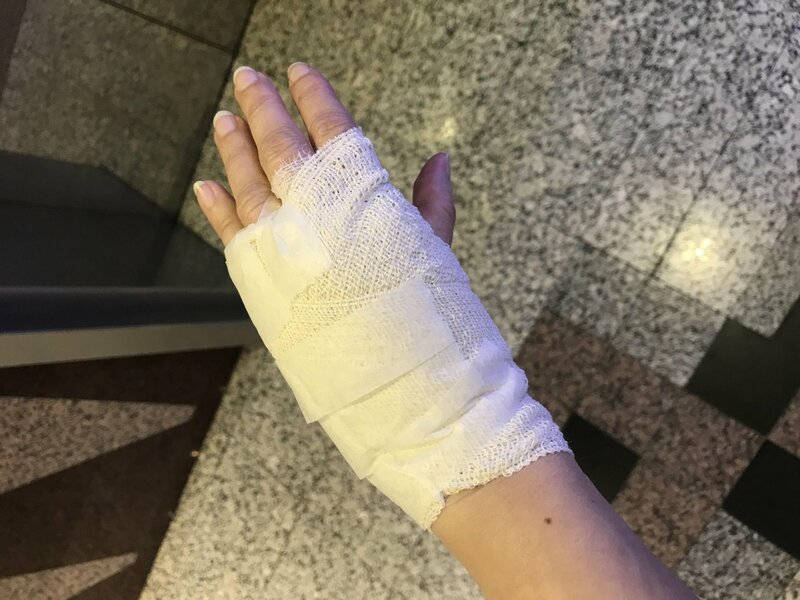 As a result, I got hurt. Not as bad as I should be yet according to the Doctor, I had second degree burns on three fingers. Not sure if it would leave any scars, hopefully not. Seeing the doctor clean my wounds and putting medicine on it burns like HELL ! Now, I need to have daily cleaning and change of dressing until my fingers heal. There goes my weekend activity of wanting to do more baking of pineapple tarts and honeycomb biscuits. Even doing simple task such as typing on the keyboard is tough because I can only move so much. Not to mention taking a shower, washing my hair or face. Even driving is tough but thankfully my car is automated and not manual. So, I take things slowly while waiting patiently for my fingers to heal. Oh ! Please heal fast. I need my fingers back.